How do you create a subdomain? I have been trying to add a subdomain to my website, and I don't know what I'm doing wrong. I found the tutorial via Yola's help section, I followed that with no results. I came on here and found a little bit more information, I applied that and still no subdomain. Help please! I would really like to know how to do this. Thanks. you need to press the big green button and then enter your subdomain. it is the second field!! I don't have that option. I don't know which package you have, but I'm just a Bronze member - paid the annual fee for domain registration and that's it. Are you trying to create a subdomain for your custom domain? Was your domain purchased from Yola? 1. Login to your Yola account and make sure you are on the "My Sites" page. 2. Click on "Domains" and then click on "Advanced domain settings". 3. Make sure the correct domain name is selected on the drop-down list on the right. 4. To access the A Record, click on "Change your DNS settings". 5. To add an A Record, click on "Add DNS Record". 6. Under "Name" add the subdomain you would like to use (eg. group). 7. Under "Value" add Yola's IP address (184.72.229.176). 8. On the second A Record, under "Name" add *.name (where name is your subdomain) and the IP address is the same. 9. Your subdomain is then available as www.group.mysite.com (for example). 10. You will be able to publish a new site to that subdomain by choosing "Use my Domain" when clicking on "Publish my site to the web". If this is not what you are looking for or if you have problems with this, please let us know. FYI, private was the name I wanted to add. The first one worked, but I don't know why the second didn't. Neither even registered with chrome, so I am using internet explorer. Unfortunately we are experiencing a slight bug in that you are unable to publish to a custom sub-domain. 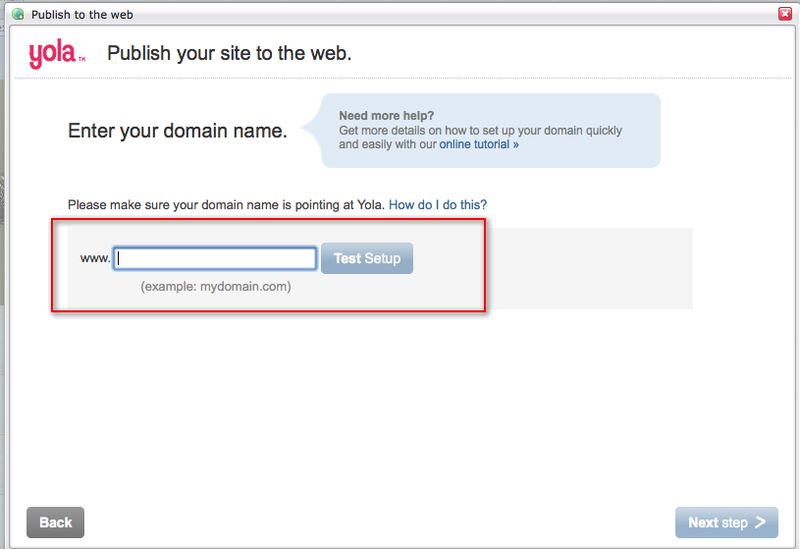 What you can do in the meantime is make sure your subdomain is pointed to Yola's IP address: 184.72.229.176 then publish your site to a free .yolasite.com subdomain. 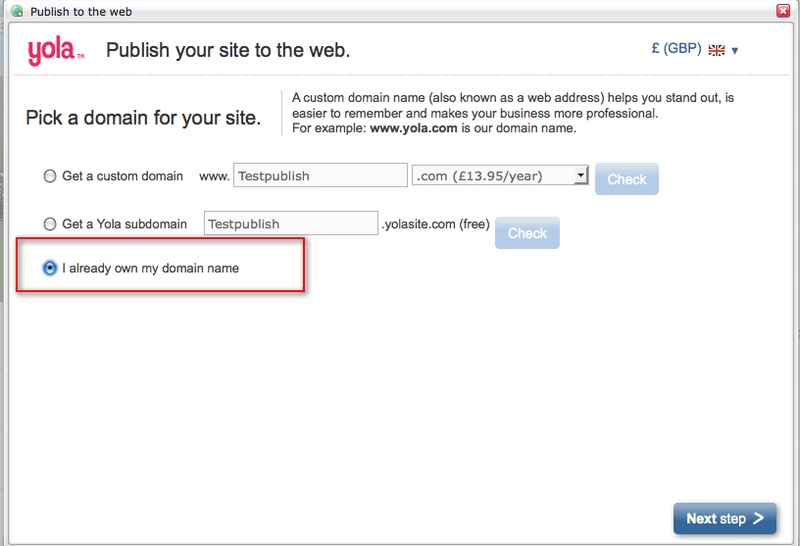 Once you have done this you can let us know what your yolasite.com subdomain is and what custom subdomain you would like assigned to your site and one of our technical team will do it for you. Thanks Will! I am going to forward this to our technical team and will let you know when the subdomain has been created, please give us around 48 hours to get this completed. Thanks much for your patience. Yes my domain was purchased from Yola, and I did all of those steps you have listed here. Except initially I used a different IP address, started with 208. I have updated it to the one that you have provided here. But it's still not showing. Maybe I'm not looking in the correct areas, I don't know. I'm looking at My Sites and Site Manager. What else can I do, or where else should I look? Thanks for the reply. Please can I have the name of your domain so I can investigate further. It looks to me like you have set the domains settings properly, and now you need to publish the subdomain to the site. Do you have a separate site in your account set up to publish this subdomain to? You will be able to publish your new site to that subdomain by choosing "Use my Domain" when clicking on "Publish my site to the web". If you are having trouble with this, can you let me know what kind of message you receive when you try to publish to the subdomain. Ok, but I don't see "Use my Domain" when clicking on "Publish my site to the web". I also do not see where I can go in and edit this subdomain to be able to publish it to the web. Where are these buttons located? I'm going to attach some screen shots of where you can find these publishing buttons (options). This would be in a brand new site, not the original site that your custom domain is published to. A subdomain needs to be published to a site that is not the main site. Hope that makes sense, let me know if I'm not explaining well enough. That did not help me at all... my screens look different from what you are telling me I should be seeing. When I click "Publish to the web" it automatically publishes and does NOT go to the next screen shot that you have shown here. I'm sorry that was not clear enough. I would like to try again, the reason you are not seeing the screens I have given you is because you are trying to add a subdomain to your currently published site: www.saverschallenge.com. What a subdomain will allow you to do is publish a completely different site to it. What you need to have established is a completely new site, not the site you currently have published. Once you have developed this other site, you can publish it to the subdomain you have created. Then, when someone visits the domain name www.saverschallenge.com they will get to your main site, and when they visit coupons.saverschallenge.com, they will get to the other site. The sites are created separately. Please let me know if that helped at all. Right, I use comm100.com for a lot of my services, and I would like to host them on my website. Comm100 suggests that I use a sub domain, but I'm not sure what to put as my subdomain. My main domain is therecipebook.org, and I do already have a subdomain, private.therecipebook.org. What would you suggest as my comm100 subdomain. I don't really want to have comm100.therecipebook.org because my visitors wont know that my external host is comm100. I am thinking services.therecipebook.org, but what do you think? I use comm100 to host the live chat, email ticket, forum, newsletter and knowledge base. Only the forum and knowledge base are hosted on my site, but I may add more detail on the other services on it; I'm not entirly sure yet. I made it. Could you put it as a subdomain please? Sure thing, we'll take care of it and let you know when it's completed! You published the domain to the wrong site. I wanted it at trbtrb.yolasite.com, not to the site published at therecipebook.org. My main site now has two domains for it. We are working on the change now. If I understand you correctly, you would like the subdomain: http://www.services.therecipebook.org/ added to the site: trbtrb.yolasite.com. Please let me know if this is incorrect. We will keep you updated when the fix has been made. Thanks. It's all working fine.